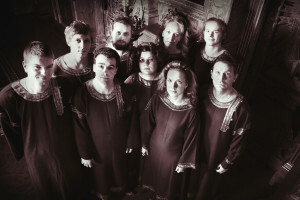 Founded in January of 1989 by Valery Petrov, the ORTHODOX SINGERS vocal ensemble has, over the past 27 years, established a reputation as one of the finest professional choral ensembles in Estonia. It has received awards at several international competitions and participates frequently in various European music festivals. The ensemble consists of professional musicians who are proficient in the performance practice styles of various epochs. The primary creative focus of the choir is early Orthodox chant, which is rarely heard in concert performances. Their repertoire also includes great works of Russian sacred choral literature: compositions by Pavel Chesnokov, Alexander Arkhangelsky, and Sergei Rachmaninoff, as well as arrangements of Russian folk songs of a spiritual nature. In the last several years, the ensemble’s repertoire has also come to include the music of contemporary Orthodox composers, among them Sir John Tavener, Valery Kalistratov, and Arvo Part. Arvo Part’s music from the Kanon Pokajanen serves as the basis for a musical mystery play The Passion according to Andrew, which features an artistic representation of a secret night-time liturgy of early Christians in the Roman catacombs. The ensemble’s concert programs also include music of Estonian composers Kirillus Kreek, Kuldar Sink, Veljo Tormis, and Arvo Part. The ORTHODOX SINGERS have toured Russia, the USA, Sweden, Denmark, Finland, Norway, Germany, Great Britain, France, Belgium, Ireland, Lebanon, Hungary, Bulgaria and Poland on several occasions, performances in the Cathedral of Christ the Savior, Moscow; the Dome Cathedral, Uppsala, Sweden; the Great Hall of the Tchaikovsky Conservatoire, Moscow; the Philadelphia Cathedral, Philadelphia, USA; the Stratford upon Avon Festivalб the Nottingham Festival, Chelsea Festival (London), J.S Bach Festival (New York, USA) and Moscow Easter Festival by Valery Gergiev. They have recorded ten CDs, including “Credo”, Ancient Chants (Forte, 1995), and “Early Russian Orthodox Chant”, Contemporary Orthodox Music from Estonia (TROUBADISC, 2007).